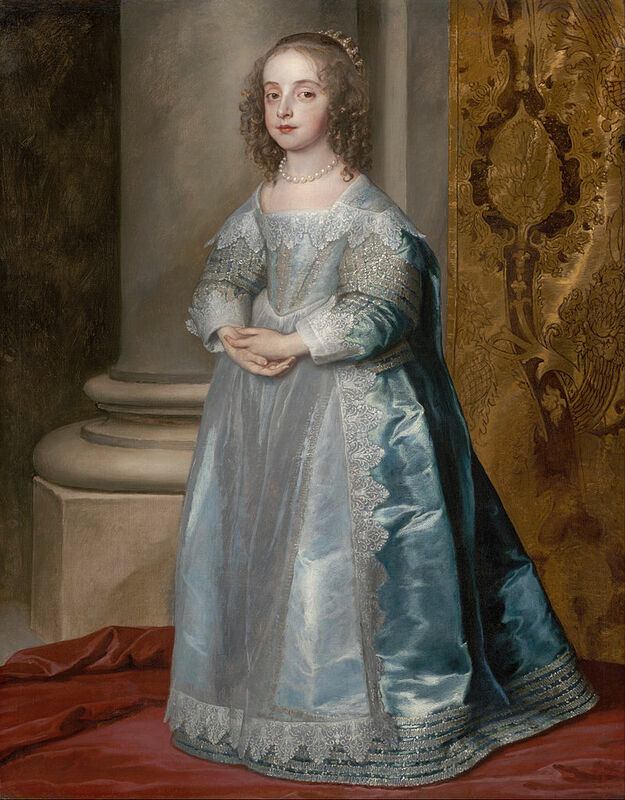 Almost a year ago, I wrote about Mary Henrietta's younger sister, Elizabeth Stuart, who had a short and unhappy life--she died when she was fourteen years old. Mary Henrietta, born on 4 November 1631, lived a longer life, but she certainly didn't live to be an old woman. 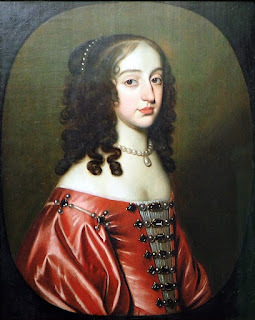 The eldest daughter of King Charles I of England and his French-born wife, Henriette Marie, Mary Henrietta, named after her mother, was only twenty-nine years old when she died on 24 December 1660. Not a long life, by any standard, but she outlived four of her six siblings--only her two brothers, Charles II and James II lived longer than she did. The deprivations and excesses of Charles's life resulted in his death at the relatively young age of fifty-four. James II, forced to abdicate the English throne in 1688, was in exile in France until his death at age sixty-seven in 1701, the last ten years of his life living as a penitent. A mostly short-lived, mostly unhappy set of siblings. But the English king was a bit more ambitious for Mary Henrietta, hoping to marry her to a Spanish prince, the son of Philip IV. The Spanish match (perhaps influenced by his own father's efforts to marry Charles to Philip III's daughter, Maria Anna of Spain) did not materialize, however, and by February of 1641, the nine-year-old princess's marriage treaty with William had been completed. The marriage between the English princess, nine, and William, fifteen, was celebrated at Whitehall on 2 May 1641. Although the terms of the marriage agreement allowed for the girl to remain in England until she reached the age of twelve, circumstances dictated a change in plan when civil war broke out in England in 1642. In February 1642, Mary Henrietta left England in the company of her mother, Queen Henrietta Maria, the two traveling together to Holland. By 1644, in the words of the delightful 1893 biographical essay in the Dictionary of National Biography, she was "fully installed in her conjugal position." There she began receiving foreign ambassadors, fulfilling her required role in state functions, and participating in court entertainments. After Frederick Henry's death in 1647, William succeeded to his father's hereditary titles and, at the same time, was elected to his father's position as stadtholder. Neither his ambitions to become a monarch rather than an elected ruler nor his warm embrace of Charles I of England, contributed to William's political popularity in the Dutch Republic. By 1650, William had decided to use force to resolve the political conflict. He sent forces to besiege the city of Amsterdam. Bad weather contributed to the surrender of the city, but William's victory was short-lived. He died of smallpox on 6 November 1650, leaving Mary Henrietta pregnant. Mary Henrietta's son, William III, was born just days later, on 14 November. Although her husband's mother, Amalia of Solms-Braunfels, would serve as chair of the regency council for the infant from his birth until 1672, her wish to be the child's guardian was denied. Instead, by the terms of an agreement signed on 16 August 1651, Mary Henrietta was designated the teacher and guardian of her child. But, never popular, she was even more politically endangered when she offered a safe haven to her brothers who had been forced to flee England. She was denied permission to receive them (or support them), and her reputation suffered when it was rumored that she was involved with either George Villiers, duke of Buckingham, or Henry Jermyn, a member of her brother James's household. In 1652, war erupted between Holland and England--after negotiating peace, Oliver Cromwell, who had become Lord Protector of the Commonwealth that had executed Mary Henrietta's father, demanded that all English exiles should be expelled from Holland. Protesting these demands, and with her health suffering, Mary Henrietta left Holland in 1654. She traveled to Spa (Belgium), where she spent several weeks, leaving from there for another spa city, Aix-la-Chapelle. 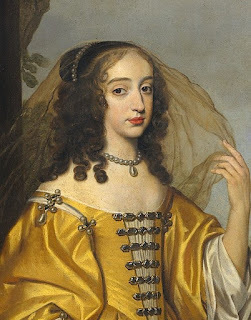 She met her brother, Charles, in Cologne (July 1655), moved on to Frankfort, and from there traveled to Paris (January 1656), where she was treated royally. She stayed in Paris until November, meeting up again with her brother, this time in Bruges. She returned to The Hague in February 1657. When she returned, Mary Henrietta fully expected to become some regent for her son--she had finally attained her "full majority"--age twenty-five--and by the terms of her husband's will, she should have succeeded her mother-in-law as regent. But Princess-Dowager Amalia did not give up so easily, and a protracted struggle between the two followed, Mary Henrietta's claims were buttressed by the arrival of French war frigates. Louis XIV seized Orange--the city capitulated to the French on 25 March 1660. This was not exactly the resolution designed to reconcile Mary Henrietta with the Dutch, nor did it assure she would become sole regent for her son. But a welcome event soon distracted her--her brother, Charles, was restored to the English throne. In May of 1660, Mary Henrietta informed the States-General of her brother's restoration. He joined her briefly before returning to England--and, significantly, he met his young nephew, William, now in the English line of succession--the boy who would eventually become king of his uncle's realm. Mary Henrietta and her son were now feted throughout Holland--bonfires in The Hague, four days of festivities in Amsterdam, special honors in Haarlem. In September, Mary Henrietta left Holland to join her brothers in London. Given her support for her brother during his exile, she was warmly greeted. She took the opportunity to ask that the payment of a promised dowry of 40,000 pounds, never made, be finally paid. A commission was supposed to look into the situation. But as the year ended, Mary Henrietta became gravely ill. She dictated her will on the day she died, 24 December 1660. There is no biography of Mary Henrietta Stuart, but you might enjoy Robert S. Rait's Five Stuart Princesses: Margaret of Scotland, Elizabeth of Bohemia, Mary of Orange, Henrietta of Orleans, and Sophia of Hanover, which you can access via the Internet Archive by clicking here. *William of Orange invaded England, aiming to depose his uncle, precipitating James II's flight from the country in 1688. William had married his first cousin, James's daughter, Mary, and while she might have inherited her father's throne and ruled alone as Mary II, she did not--parliament declared William and Mary to be joint sovereigns: "the sole and full exercise of the regal power [would be] executed by the said Prince of Orange in the names of the said Prince and Princess during their joint lives." Parliament further decided that, if Mary died before her husband, William would continue to remain as king--thus James's second daughter, Anne, did not become queen until eight years after her sister's death in 1694 (she was only thirty-two years old)--William continued to reign as king until his death in 1702.